I got an email from Nick, the guy who won the Store Championship I went to a couple of weekends ago with a pretty nice article attached that I think you guys would dig, so today I'm turning over the bar to Mr. Jones. First off while I consider myself a frequent gamer I have traditionally stuck to board games. Yes I have played in a few RPG groups over the years but board games have been the core of my game playing over the last 10 years. Before x-wing I never could get myself into a miniatures game. Perhaps it was the typical or at least perceived large investment to be competitive in a miniature game. One day my friend Mike asked me if he could catch a ride with me back to his home town. He informed me he was going to defend his x-wing store championship from the previous year. As a gamer and long time Star Wars fan this peaked my interest and I did a little research. A few youtube and google searches later and had learned enough to interest me in going to watch a match. Even if this was a mini’s game it seemed very different to me. I stopped by and watched one of Mikes matches, unfortunately it was the one match that day that he lost against the eventual champion. He took second place that day. I was still on the fence about this game but figured why not try and play a few matches and see if I like how the mechanics work. Lucky for me the owner of my FLGS (The Gaming Goat) owner was able to get me in touch with someone who had enough ships to field a few squads and was willing to teach me how to play. We set up a date at our FLGS and played two friendly matches 50ish points and 100 points I believe. In the first I played with some Imperial troops the second with some Rebel Scum. I won both matches in dramatic fashion. I had some solid dice rolls and attributed it to my super friendly opponent possibly trying some new builds and ships that he was not familiar with. Regardless, at that point I was hooked. With x-wing I found a game that has a subject matter that is of interest to me and a game mechanic that matches up very well with the real (read as ’how they worked in the movies’) actions and abilities. With the option of playing casual with friends through different scenarios or in tournament play the game has great versatility. Couple this with the inevitable release of additional Star Wars movies on the horizon this seemed to be a game that I could get behind and will likely have some legs to stick around for a few years. Even if it doesn't have the staying power we would all like Star Wars is a classic and a game I can pull out and play with anyone. So whats next? Well My buddy Mike who got me interested was in the tourney scene so I figured why not try my hand at a store tourney. This would allow me to see if I was in fact any good at this game and how I liked playing against various opponents. It just so happened that another FLGS less than 20 minutes from my home was having a store championship the following weekend with a $5 entry fee. Perfect, oh and low cost enough that I wouldn't feel bad walking away from it if I ended up not liking it at all. Next problem, what do I fly in this tourney? Through the week I bounced back and forth between just fying Mike’s tourney build (Han Shoots First) that he would let me borrow or going ahead and making an investment and flying something else. I literally considered hundreds of different options, read hundreds of forums talking about builds, calculated costs of putting together builds etc. etc. etc….. In the end I ended up with one option, going with my gut. Sorry Rebels, I'm an Imperial loyalist. Once I made this decision I was down to two options tie swarm or swarm with a few advanced or interceptors mixed in. Yes, yes, yes I had many long and drawn out conversations with Mike about how difficult it is to effectively fly a Swarm. The way I saw it was that if I was going to be any good at this game I might as well learn how to fly one of the most difficult formations first. If I can do that then I should be able to mix in other challenges. So it was settled, Tie Swarm. This is where I threw out the option of keeping my initial investment on this game under $40. That being said I opted to purchase two core sets and a Tie Expansion from my FLGS and borrow Mike’s two ties to make a 7 tie swarm. This way I was at least keeping costs close to $75 for an initial investment. Im not happy about it but at least I know I have the tools to be competitive in the game. Plus Mike had talked about going to a Swarm Build sometime soon and I figured I could likely recoup at least part of my investment if I didn't stick with it and sold out to him. Again, I read up and watched many videos including the 2013 Worlds Finals where Dallas Parker nearly took his tie swarm to a world championship Notes taken and film studied I thought I was ready to give this a swing. .
My first Store Championship. Keep in mind to this point I had only really played 2 matches. neither of which had been with the squad I was flying on this date. I showed up and met some of the guys who were going to be playing and had a good chat with them as we were getting organized for the matches. Because I didn't have access to the exact modification used by Dallas at worlds I opted to load Howlrunner with determination and a shield upgrade (borrowed) to put me at 99 points and likely get me initiative in my matches(more on where this came in handy later). 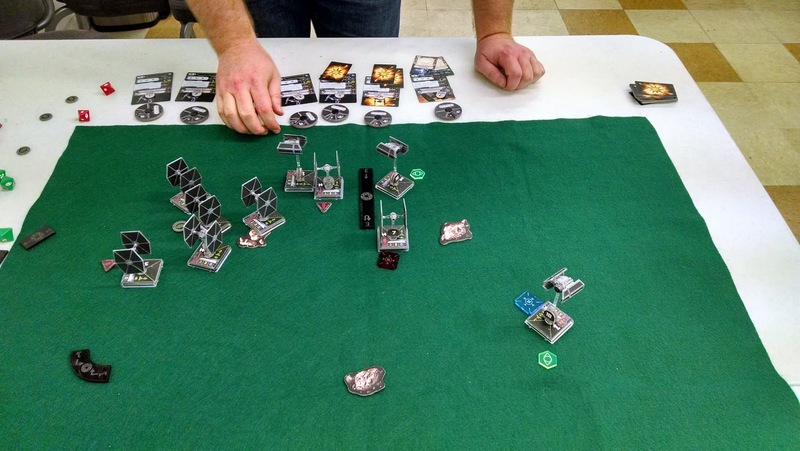 Opponent - One of the TO’s Running a medium pilot skill, 6 tie swarm. I don’t recall the exact build but it was something along the lines of Howl, Backstabber, 4 x obsidian plus misc. upgrades including some missiles or bombs. This was a very close match trading ships until we were nearly at time and I was able to take out his Howlrunner before he could take her off of my swarm which was still in a very tight formation. I had a number of bumps into my own ships costing me a number of actions and started the game off successfully spacing 4 of my ties out from the other 2 in the swarm while I had Dark Curse Running a Diversion. I was able to get them close enough for howlrunner to be very effective which no doubt led to the win. Opponent - Sean running the APL and Ionizes list, 2 Outer Rim Smugglers with Anti Pursuit Lasers and 2 HWK’s with Ion Ion Turrets. Since this was the lists first run in tournament play and I had not played against a single HWK or YT in any match I was very worried. I stuck to a strict strategy of concentrating fire and getting his ships off the board as quickly as possible.I knew that the YT’s would be tough but were going to be a vital part of his strategy. Having initiative gave my Acad Pilots the ability to Block one of his YT’s so that everyone else could pounce on it (Initiative Pays Off!!). I was less worried about the HWK’s (which was a mistake) simply because without that YT’s on the board they are significantly less effective. That being said my Low Pilot skill swarm was just the kryptonite that was ordered to make a tight match with the APL’s and Ionizes list. you can read more about this on Sean’s writeup at themetalbikini.com. Long story short I put one YT and one HWK off the board after losing 2 acad pilots and Howl in the last round before time was called. due to points I took the modified win. This is one match that I would have really liked to see played out to the last ship. It could have gone either way. At this point I was a bit intimidated. Come on, first tourney squeaking into the championship match against a guy who publishes a website dedicated to the game. Honestly, what kind of chance did I have? (The dude obviously didn't read TMB before we played or he would have known better, amirite?) Time to knuckle down and just stick to the strategy that had gotten me there. focus fire and keep the formation tight. Keeping the formation tight ment I had to fly over some asteroids luckily my hit dice were forgiving in these instances. I was able to knock out two of the advanced and put the other two on the run just before time was called. And Somehow keep from losing a single ship. 3-0 - Store Champion - Solid Days work and I guess I kind of have to go to a regional at this point. 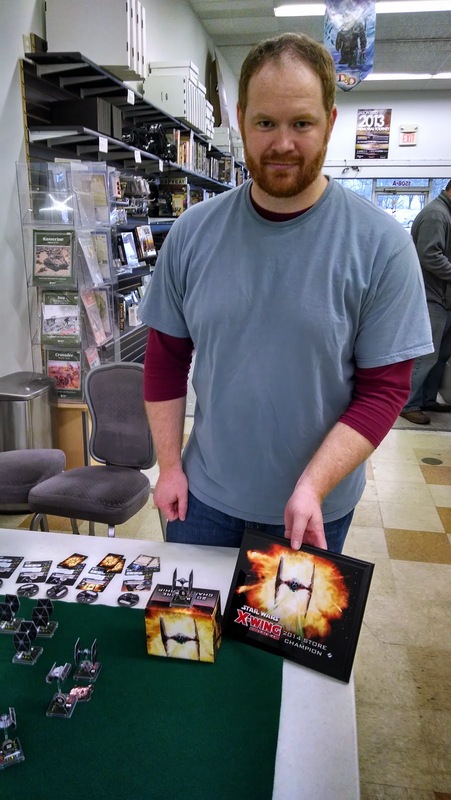 Moving forward, I am working with my FLGS and some of the guys I met at the tourney to set up a league to get more people interested in this great game. They sell a lot of the parts for the game but said they are not sure if people just are collecting or playing at home. Time to spread the word at these two stores and get some people out to play on a regular basis. You damn skippy you gotta go to the Regional, man! What do you think Part 2 of this article is gonna be called? "HOWTO Not Go To a Regional Even Though You're a Store Champion?" Nah. Nope. Don't think so, pal!